We're wondering what might be next for Red Bull Straight Rhythm in the U.S.—but Australia isn't waiting around! 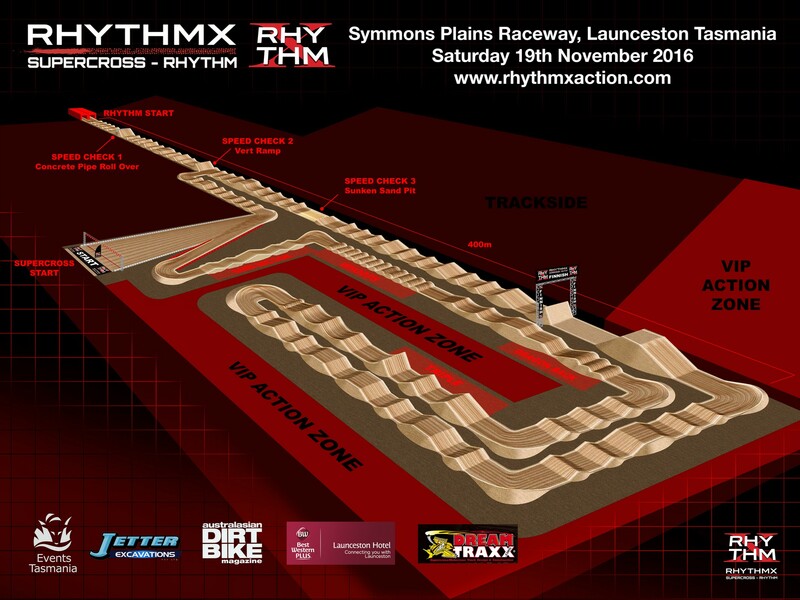 A Straight-Rhythm type event has just been announced Down Under, with a track built by Jason Baker, who builds the Red Bull Straight Rhythm track. American riders Justin Brayton and Wil Hahn, who are already racing in Australia right now, have been confirmed to race. Check out the youtube clip. The event takes place in Tasmania on November 19, the weekend after the big Aus-X Open event, which is coming this weekend in Sydney. What's interesting is, the rhythm track is tied into a regular supercross track, and there will apparently be both types of racing run on the same night. The purse is a solid $80,000. Straight Rhythm track and supercross track combined a few weeks from now Down Under. Exciting news has just been released that two top American Supercross riders will be hitting Tasmania November 19 for the inaugural Rhythm X event to take on the top Australian riders already committed to the event. Justin Brayton who finished 8th in the prestigious AMA Supercross Series in America this year where the best in the world do battle will be hitting the Rhythm X track alongside fellow American Wil Hahn who is also a regular top-10 rider in the AMA having won a US East Coast 250cc Championship. Both riders have been dominating the current Australian Supercross Championship with Brayton currently three wins from three events and looking likely to take out the championship here in Australia. Hahn also hot on his toes with podium finishes has been a major highlight so far in the series. “I’m really excited to experience Tasmania, there should be some really great racing and it will really cap off my trip in Australia” Hahn said. Brayton is very familiar with this new straight rhythm competition having finished second to the world’s best rider at the time James Stewart when the first rhythm event was ever held in America in 2014 so he will be looking to draw on that past experience to take the most out of the $80,000 prize purse on offer. “With regards to the track, it looks unbelievable; honestly as good as anything I have seen or raced on around the world. I can’t wait to go out there and hit it,” said Brayton. The two Americans will battle it out against the best in Australia including Dan Reardon, Dean Ferris, and Kade Mosig along with a host of other great riders. The Australians have been taking it to the Americans so far this year on the track so it will be action a plenty when they face off side by side in the unique rhythm format. "It is great to be able to announce these two exceptional American riders and I think a true indication that this exciting new format hitting Australia for the first time is worthy of these great riders. I think the crowd will love seeing our top Aussies take on these Americans head to head down the rhythm track and again on the supercross track,” Richard Stevenson Event Director explained. “With Jason Baker delivering a world class track these riders know it’s going to be a big challenge and being involved in an Australian first is always something to remember” Stevenson added. With just a few weeks before the event it is shaping up to be one of the major dirt bike events people will see this year and not one to be missed live. Tickets are on sale now, with tickets and information available at www.rhythmxaction.com.